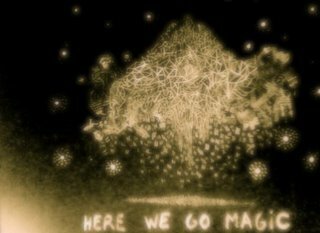 >Today’s New Band – Here We Go Magic PLUS! Marlon Brando! >If you watch On The Waterfront, like I did yesterday, you’ll quickly realise that it’s a rare movie of real brilliance. Marlon Brando, in his handsome, quirky youth, has huge impact during the film – impact that even a non-movie buff like me can see. His characterisation of Terry Malloy seems ‘real’ and convoluted in comparison to the relatively staid movie traditions that dictate the rest of the film’s pace and feel. As such, Brando straddles the old cinema and a whole new type of cinema within one role, within one movie, and you can see it happening right in front of you as you watch. Some bands do the same thing. Witness The Beatles (them again) zipping from ragged, hormonal rock ‘n’ roll to the lucid insanity of the St. Pepper’s era within a decade. See Public Enemy (them again, too) hopping from rapping about cars over lumpy beats to dazzlingly fierce, angry noise and free-wheeling, intelligent lyricism in the space of an album. These bands were driven by a desire to do something differently; to stand near the edges of acceptance and have faith that when they kept pushing into the new, the results will be worth it. Not all bands that do this become Public Enemy, but the very fact they’re still trying in a time when mass-conformity is an easier route than ever is enough. So here’s hoping, as we hope with every band on ANBAD, that Today’s New Band, Here We Go Magic, make similar giant steps. They’re from Brooklyn and are the kind of excitingly well-formed, forward-looking band that makes trudging through all the average bands’ MP3s worthwhile. Like most really good bands, on their recordings they sound like they’re playing just next to you, except they couldn’t really do that, as their sound is too coiled with thrilling complexity. Songs like Tunnelvision are like a breeze of cool air on a sticky day, refreshing, natural and alive. Fangela is so soft and dreamy that blissful sleep might be induced in all it’s listeners at the point where the song brilliantly slumps into an organised jumble of cascading sound. Both Of Us, howling with rounds of feedback, is a step on from the kind of sonic experimentation that Spiritualized used to be so good at, repeating variations on the same sound again and again and again until they mean something special. It’s hard to imagine who could be so cold hearted and lacking in heart to not love Here We Go Magic. Delicate, bold and inventive, the sounds they make will linger in your head long after you’ve heard them; if the melodies themselves don’t loop crazily in your memory, then the feeling they induced will. Lovely, lovely, lovely. Check them out here! Posted on January 19, 2009 by Joe Sparrow. This entry was posted in "Brilliant" Bands, Today's New Band and tagged loopy, not-quite-NOISE. Bookmark the permalink. ← >Today’s New Band – Die, Chihuahua Die PLUS! T-T-T-T True Confessions! >Another great band on ANBAD. I saw Brando in A Streetcar Named Desire at the weekend. I love it when cinemas show old films. Brando was mesmerising. He also spent most of the film with his clothes ripped off, which is no bad thing, I can tell you. >Thanks again Roland – I will admit that Brando is one buff fella in On The Waterfront, but I was more interested in his intellectual depth, *honest*.